I masnadieri, one of Verdi’s least-performed operas, premiered in 1847 in London – the first work he composed for a non-Italian theater. The opera is from the period Verdi referred to as his galley-slave years, and it follows the then traditional style of aria and cabaletta. For me, the biggest problem with the opera is the libretto, written by Andrea Maffei, a good friend of the composer, and based on Schiller’s Die Räuber. It is truculent and depressing, and one cannot help but remember librettos by Camarano, Piave and Boito. The Gabriele Lavia production, which originated in Naples in March 2012, is disappointing. 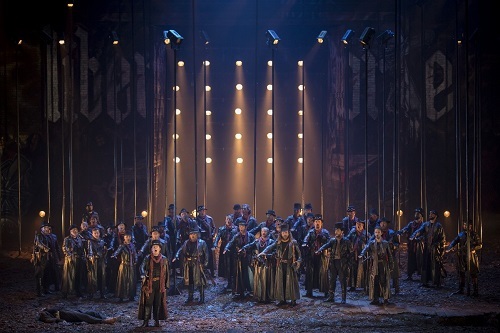 There is a single set for the opera although the individual scenes move from the outskirts of the bandits’ forest to Count Moor’s palace to the dungeon where Massimiliano, the father of the two brothers and rivals, Carlo and Francesco, is practically buried alive. The stage is filled with fake metallic trees; it opens up at the front and there’s an armchair where the interior scenes take place. At the back of the stage a huge skull bears the words ‘Freedom or Death’. The costumes are not of much interest, and the lighting is all right but could be improved since lights are more important in a simple production of this kind. As for the stage direction, there isn’t much of it. In the end, it seems that the chief contribution of Gabriele Lavia to the production is to make Francesco Moor lame. The Musical Director of Le Palau de les Arts, Roberto Abbado, was the conductor, and his performance was satisfying, with a good Verdi pulse. At times the orchestra was too loud, given the voices on stage, but it is a remarkable group and, overall, they gave a strong performance. The chorus was excellent. Tenor Fabio Sartori had been announced to sing the part of Carlo, but he canceled and was replaced by Stefano Secco whose delivery was, to a large extent, insufficient. A larger voice is needed for this character. Secco’s voice is good in the middle range, but it narrows remarkably as it goes up. In addition, his singing is not very well suited to Verdi’s phrasing. Amalia was played by soprano Roberta Mantegna, whose performance, like that of Secco, was not very convincing. The truth is that I expected more from her, considering the reviews I had read of her Amalia in Rome and in Monte Carlo. As the tessitura rises, her voice becomes more metallic and less attractive, and somewhat uncontrolled at the top. Baritone Artur Ruciński was the most compelling singer of the whole cast. He possesses a beautiful voice and good phrasing, and he offered a splendid interpretation of the evil Francesco. Michele Pertusi and his elegant singing gave life to Count Massimiliano Moor. In the secondary characters Gabriele Sagona did well as Moser in his scene with Francesco in the last act. Boom Joo Lee was also correct as Arminio. The audience gave a warm reception to the artists with the biggest applause for Artur Ruciński.